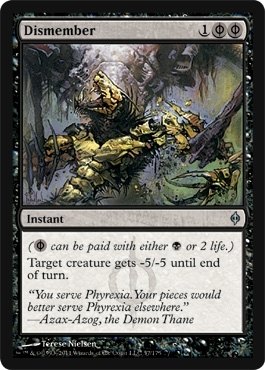 Phyrexian Obliterator was a feared card when New Phyrexia was being announced, yet it hasn’t seen a single top at any Standard event (and only saw limited success in a few top decks in Legacy for a week or so after New Phyrexia’s release) despite what this card should’ve been able to do in Constructed. ElspethFTW praised it before the set was released. However, as was discussed on the Magic Show, it’s obvious what happened to it. Dismember. 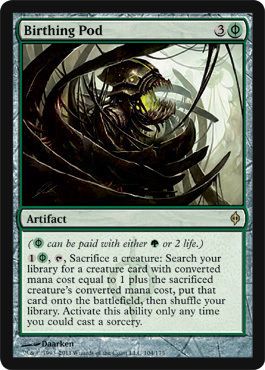 Dismember is being hailed as both a great card and a horrific mistake by R&D and Design; Dismember destroyed the color pie and will haunt the game unless it’s banned or outclassed; and this isn’t a card I want to see outclassed. Personally, Dismember has made the game worse as it makes a lot of creative decks (like Phyrexian Obliterator or Geth, Lord of the Vault, and anything with 5/5 or lower) meaning that things like Primeval Titan, Sun Titan, and Consecrated Sphinx rule the format of large creatures, while the rest of the format is things like Squadron Hawk, too little to be a lot of a threat, but ends up used on them regardless.